This answer to the question of our employment usually leaves the inquirer with a puzzled look on their face as they mentally try to decipher the meaning of our statement. “Automata, what’s automata?” Our response of, “we make moving figures” turns a light on; “Oh, like those dancing Santas, I have one of those.” Technically correct, but not really the same thing. The husband and wife team of Peter Meder and Chris Chomick have been working together for forty years. 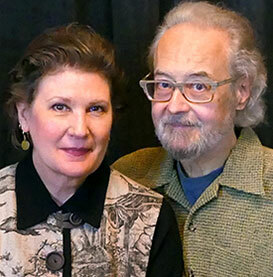 They met in 1978, while employed as clerks in an art supply store in the Chicago loop and discovered their mutual fascination with puppets, stop-motion films, and mechanical toys. Inspired by their interests in puppets and animation, they immediately began collaborating on various projects; one of the first being a stop-motion animated puppet of the Dutch Boy for Sherwin Williams Paints. This began a career creating special effects for national television commercials. In creating their figurative artwork, Chris and Peter combine the knowledge and strengths of their different art backgrounds to create their own unique form of figurative art and automata. They each have defined rolls based on their individual skills: Peter builds the interiors and supports (armatures, mechanisms, display boxes) while Chris creates the exteriors (sculpting, painting, costuming). Chomick+Meder’s work has been featured in various national and international art doll and automata publications, and is included in many private collections throughout the United States, Canada, Asia and Europe. In 2018 they were given the golden Max Oscar Arnold Award in “Category 13. 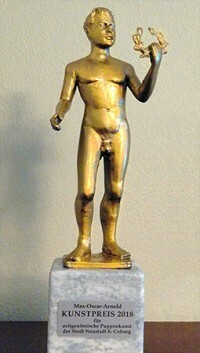 The best overall work of an established artist” by the Cultural Council of Neustadt bei Coburg, Germany. In the Chomick+Meder team, Peter is the Idea Guy and Quality Control. He builds the armatures for our figures; designs and builds the mechanisms, display boxes and electronics for the automata. Basically, in charge of creating the Interiors of our figures. He was born in Chicago, Illinois and during his childhood, lived briefly in Würzburg, Germany. As a child, Peter was fascinated with window displays, puppets, magic, stop motion animation and was often reprimanded for taking his toys apart. He was ten years old he made his first Automaton, a “Strongman”, carved from a cork and clothed in an outfit he had sewn from an old sock. It was powered by a motor he constructed using a rubber band, a spool, piece of wax, and a few toothpicks. Peter graduated from Loyola University, Chicago with degrees in Fine Art and Communication, he worked as a Model Maker, creating special effects for national commercials [McDonald’s, Standard Oil-Amoco, Fisher Nuts, Sherwin Williams]. In the Chomick+Meder team, Chris is in charge of Promotion and the creating the Exteriors. She sculpts, paints and sews the costumes; and is the hairdresser as well. Molding and casting is also part of her job and she has recently added 3D sculpting and printing skills. She was born 1954 in Burnaby, B.C. Canada, one of seven children. Her childhood was filled with drawing, sculpting and craft projects through which she would make dolls and toys for friends and family, often sacrificing her own toys. Her mother once found her with a handsaw “redesigning” one of her baby dolls for yet another project. She went on to trade school to study Commercial Arts which led to a career as an advertising Production Artist. She later turned to drawing, painting and sculpture as forms of artistic expression, eventually discovering polymer clays and figurative art sculpture. Aside from sculpting our figures, Chris is a freelance graphic designer for both web, print and Book design. Our design process starts with an attitude. We find inspiration in strange and unusual imagery; beautiful but disturbing, intriguing yet provokes feelings of uneasiness. What is your background? Did you have a creative childhood? PETER: My parents were from Germany and for a year we lived in Würzburg near a vineyard, art supplies were not readily available and I would make things with whatever materials I could scrounge: balsa wood, corks, t-shirts, old socks, etc. I made my first automaton, “A Strongman”, out of carved cork, and old sock for clothing and a matchbox as the base. Two flat matches were the levers, when the first was pushed the Strongman would stand up and raise the weights to his knees, push the second lever he would lift the weights over his head. CHRIS: My earliest art-related childhood memory was of my mother sketching on a brown paper bag. I remember thinking how beautiful the woman in the drawing was and knew in my very young age that my mother had talent. She was a stay-at-home mother in charge of a handful of pre-school children and to keep us pre-occupied and entertained (ie. quiet) we would all draw the selected object. I distinctly recall drawing a wooden wall plaque and my mother declaring that I was an artist. From that point I was encouraged to “Learn to Draw with Jon Gnagy” followed by children’s crafts books the art of making sock puppets. I learned about perspective in the second grade and literally felt my ‘inner eye’ explode, now there was no limit to what I could draw. In my early teens I learned to sew in Home Economics and made dolls and toys for friends, sometimes sacrificing my own dolls for body parts. Describe the first doll you made as a team. Our first doll we made as a team was a stop motion puppet of the Dutch Boy for a Dutch Boy Paints commercial commissioned by a Chicago production company. What kind of figurative art do you make? How do you describe it when asked? Animated or moving figures, non-traditional, contemporary. “Figurative art” or “characters” rather than “doll”, since the word “doll” inserts a visual point of reference in their mind. When we show our work they usually say, “That’s not a doll”. We have heard our art described as ‘scary’ but quite honestly do not see why, to us they look quite benign compared to our original vision. We are both self-taught and developed our style through years of observing our surroundings focusing on interesting faces, outrageous hairstyles, distinctive attitudes. As children we each found a fascination with animated window displays, puppets, stop motion films, mechanical toys — anything that came alive though movement. What is your favorite medium, what do you like most about it? Our choice of materials depends on if the figure is still or moving and the character, if it is more conservative or extreme. As far as constructing the figures/automata we use epoxy clay, cast resin, silicone, brass, wood, glass eyes, horsehair, radio control parts. Still figures can use a wider range of fabrics, while an automaton requires light fabrics that won’t restrict the movement. We like to use vintage or unusual trims and buttons to accent the costumes. What do you love most about being an artist? Having the freedom to create everyday, making what that we would enjoy having in our home and holding something in our hands that had previously only existed in our imagination. The reaction from people who understand where we are coming from is very rewarding. What has been the biggest challenge working as an artist? The biggest challenge for artists is isolation. While there is an artistic drive to create for yourself it is important to have an outlet beyond your inner sanctum. If artists don’t have the support or feedback from our immediate circle we are not sure what we are doing has any meaning or purpose. Artists need to find kindred spirits and know they are not alone. What inspires you? What led you to create your current style of work? We find inspiration in strange and unusual imagery; beautiful but disturbing, intriguing yet provoke feelings of uneasiness. People we encountered on our travels with interesting faces, outrageous hairstyles, were the inspiration for many of our figures. We were greatly influenced by the 15th century art seen in the German museums and churches, specifically the religious figures and effigies, wax castings of various limbs ornately embellished with healing prayers for the afflicted appendage. One of Peter’s early automaton influences was at the Käppele, a pilgrimage church in Würzburg, which had a miniature automaton diorama where for a pfennig (a penny) Jesus would emerge from a chapel and bless the parishioner. How has your art, style, or technique changed over the years? CHRIS: I recently began working with epoxy clay; since it is an air-drying medium, it requires planning which is a very different technique than polymer clay. I find Epoxy clay has exceptional versatility in that it has the fine grain structure and modeling properties of paper clay, water can be used to smooth and refine the surface, it does not require an oven to cure, and has the rock hard strength of resin when dried. We also added cloth figures to our line of characters, which are digitally printed cloth doll patterns based on my colour pencil illustrations and merged with photo-montages, then sewn and assembled by us. We see many possibilities in working with digitally printed textiles of our own design. What advice can you share with aspiring artists? Stay focused on the original concept and not be confused with too many “new and improved” revisions that can result in a character’s design feeling “forced.” If a new idea is inspiring, but not right for the character, or compromises the design, save it for the next project. Do you have any projects are you currently working on or have planned? Art automata, one-of-a-kind figures, digital print cloth figures, 3D printing projects, online videos and blog posts. Where can people find your work? Our work can be seen locally in St. Petersburg at Florida CraftArt Gallery, online through our website and our “Cabinet of Curiosities” Etsy shop, or at one of the annual NIADA Conferences held at different locations. The first “doll” we made as a team was a stop motion animated puppet for a national television commercial. This opportunity literally came knocking at our door. A friend had recommended Peter to a local visual effects company who was looking for someone to make a puppet for their commercial. The company provided us with the advertising agency’s layouts of the television commercial. The object of the commercial was to introduce Sherwin Williams new “Dirt Fighter Paint.” It begins with a man named “Henry Waller” lamenting about how he hates his walls because he can not keep them looking fresh and clean without having to paint them over, and over again (apparently his kids were never introduced to the sink). The commercial ends with our hero, the Dutch Boy, as he walks on screen and reaches up on the wall to wipe off the tagline “For walls that get dirty again. And again. And again.” like he was cleaning off dirt. It was a well executed, entertaining commercial. The challenge for us was in order for the Dutch Boy puppet to reach up and wipe off the dirt, he had to go up onto his toes, but the shoes had to stay flat on the ground, only his feet could move, so he had to have flexible ankles, which was tricky because he was only 9″ tall. An even greater challenge was we had to have him finished and delivered by Monday, which gave us THREE DAYS! We had no time to waste, or PANIC! It was a tag team approach, one slept while the other worked. Peter made the armature; Chris sculpted the head; he sculpted the hands and made the shoes while she sewed the clothes. Chris finished painting and applying the hair while Peter made the hat and a miniature natural sponge. After three grueling days, we finished the Dutch Boy puppet and delivered him Monday morning, much to the advertising agency’s surprise — they didn’t really MEAN Monday. And such was our introduction to the exciting world of tight deadlines and the beginning of a lasting (and beautiful) partnership.